The federal government discriminates against First Nation children on reserves by failing to provide the same level of child welfare services that exist elsewhere, the Canadian Human Rights Tribunal decides. The federal government discriminates against First Nation children on reserves by failing to provide the same level of child welfare services that exist elsewhere, the Canadian Human Rights Tribunal has ruled. 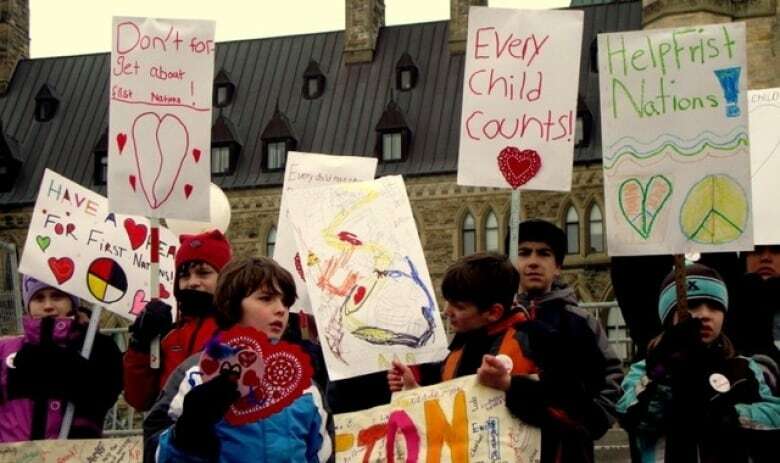 Cindy Blackstock, executive director of the First Nations and Family Caring Society, along with the Assembly of First Nations, filed a complaint against Ottawa with the Canadian Human Rights Commission in February 2007. They argued the support the federal government provides for child welfare on reserves is much lower than the support provincial governments give to children off reserves – even though on-reserve needs are greater. Less funding for family support means more children end up in the child welfare system, they said. The Canadian Human Rights Tribunal agreed, according to a decision published Tuesday morning that says the federal government's funding model and management of its First Nations child and family services "resulted in denials of services and created various adverse impacts for many First Nations children and families living on reserves." The decision says the government must "cease the discriminatory practice and take measures to redress and prevent it." It calls for the redesign of the child welfare system and its funding model, urging the use of experts to ensure First Nations are given culturally appropriate services. The decision also compares on-reserve child welfare to the residential schools system, where "the fate and future of many First Nations children is still being determined by the government." It recommends increasing funding and support to allow First Nations to deliver their own child welfare. An emotional Cindy Blackstock told reporters the decision was a "complete victory" for children everywhere, but she questions why the fight was ever necessary. "Why did we have to bring the government of Canada to court to get them to treat First Nation children fairly? Little kids," she said. "Why would it ever be OK to give a child less than other children?" This gathering at Parliament Hill was for the annual youth-led Have a Heart Day in 2012. On Tuesday, the Canadian Human Rights Tribunal ruled the federal government discriminates against First Nation children on reserves by failing to provide child welfare services equal to those elsewhere. (First Nations Caring Society)AFN National Chief Perry Bellegarde says he hopes to see an indication of the government's willingness to work on the issue in the upcoming federal budget. "We'll be watching to ensure that that happens," he said. "All of Canada will be watching." In a news release, the Canadian Human Rights Commission also applauded the tribunal's ruling. "This historic decision could have a profound impact on how the government of Canada funds other on-reserve programs and services," wrote Marie-Claude Landry, chief commissioner of the human rights commission. Speaking to reporters, Indigenous Affairs Minister Carolyn Bennett agreed with the decision and said her department would soon begin working with the Assembly of First Nations and other indigenous groups to come up with solutions. "My job is to go forward and fix these things." Bennett said any fixes would require significantly more money, but she wouldn't say how much. "It's difficult to put a price tag on not providing indigenous children with the opportunity to be able to succeed," said Justice Minister Jody Wilson-Raybould. Hearings only began in 2013, and the federal government made multiple attempts to have the case thrown out. "They fought right out of the gate," Blackstock said. Before final arguments were heard in October 2014, during which the tribunal heard from 25 witnesses, the federal government had racked up $5.3 million in legal fees. "Never once were those motions brought because they felt it was in the best interests of the children," Blackstock said. "It was always to protect the government."